YARN Knit Picks Capra DK (85% Merino Wool, 15% Cashmere; 123 yds/50g): Celestial 24967 (MC), 8 (9, 9, 10, 11, 13, 13, 14) skeins, Cream 24974 (CC), 1 (1, 1, 1, 1, 2, 2, 2) skeins. If you are knitting a men’s version of this sweater for a very tall man, you might need more yarn for a longer body! NEEDLES Size 7 (4.5 mm): 24” or longer circular, 16” circular, and double pointed needles (DPNs). Adjust needle size if necessary to obtain the correct gauge. NOTIONS Markers (m); stitch holder or scrap yarn, tapestry needle, six 5/8” leather buttons. Today’s Los Angeles Dodgers started in Brooklyn, but in the late 1800s Brooklyn was home to many baseball teams with fantastic names like Atlantic, Eckford, and Excelsior. When leagues started to shake out, it was the Trolley Dodgers that prevailed. They would be known as the Dodgers, and as the first team to break the baseball color barrier by putting Jackie Robinson in uniform in 1947. In 1958 they made the move to LA, where their team name makes no sense, but the history of the Trolley Dodgers is a big part of what makes baseball great. 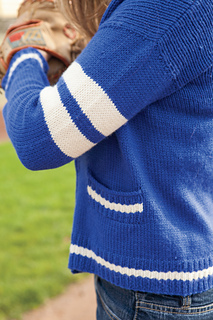 This cardigan is a tribute to the baseball sweaters that were part of the team uniform at the turn of the 20th century. Drop sleeves, pockets, sleek button bands, and asymmetrical sleeve striping were typically found on sweaters throughout both leagues. Very little has been salvaged about the history of these sweaters, and they obviously aren’t part of the uniforms of modern day baseball players, but pictures of baseball legends like Christy Mathewson and Ty Cobb wearing them let them live on. Customize Trolley Dodger with your team colors and pay tribute to an unsung part of baseball history. Notes: Cardigan is worked from the bottom up in one piece to the armholes, then fronts and back are worked separately to the shoulder. Stitches for the pockets are held to be worked later. Sleeves are picked up and worked from the body down. Stitches are picked up and a double-thick button band is worked. Pocket bags and ribbing are finishing touches.